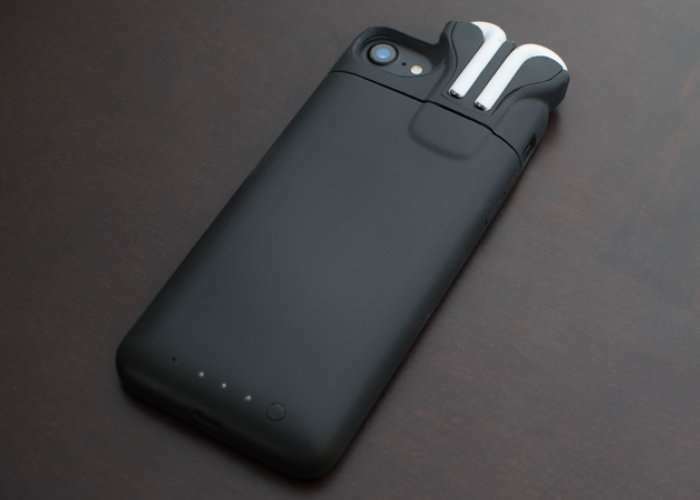 iPhone users that also own Apple AirPods, may be interested in a unique battery case which has been designed Nova Technology a small group of developers based in California who have worked on projects such as the Pebble Smartwatch and Avegant Headset. PodCase has been designed to charge and hold secure your Apple AirPods in a rechargeable iPhone battery case which removes the need for you to carry the AirPod charging case. Watch the video below to learn more about the PodCase which is launched on Kickstarter this week and already has over 200 backers. • Slim case for carrying and charging your iPhone and AirPods. • 2500 mAh extra battery: enough for a full charge for your iPhone or up to 40 AirPod charges. PodCase comes in two sizes, iPhone 7 or iPhone 7 Plus. We’re planning to design a PodCase version for iPhone 8 as well. Since the Apple announcement is scheduled for September 12, we plan to announce support for it during this campaign. You can switch your reward anytime during the campaign. PodCase is now available to back via Kickstarter with early bird pledges starting from just $79 and delivery expected to take place during February 2018. For full specifications and more information jump over to the official Kickstarter campaign page via the link below.